Earthwatch partner Royal Dutch Shell is a global group of energy and petrochemical companies, involved in environmental initiatives tied to employee learning, scientific research, and more. Shell and Earthwatch have worked together since 1999 and became strategic environmental partners in 2008. Taking part in hands-on research projects around the world which have been selected for their relevance to Shell as a company. Each year, 49 Shell employees volunteer on Earthwatch projects. So far, more than 500 Shell staff have taken part in the program, returning with a greater awareness and understanding of environmental issues. As a key partner in Shell’s Project Better World (PBW) initiative, Earthwatch provides Shell employees with a unique experiential learning opportunity to take part in hands-on research. The research projects around the world have been selected for their relevance to Shell as a company with a worldwide environmental footprint. 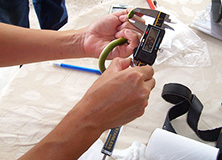 On the Climate Change at the Arctic’s Edge project, Shell employees conduct vegetation surveys, measure pH, moisture, and other features of the soil, take permafrost cores, set live traps for small mammals (in summer), and classify ice crystals and take snowpack measurements (in winter). This personal and professional development experience increases their understanding of sustainable development issues in the context of Shell’s operations and inspires employees to promote environmental initiatives at work. At the same time, it provides a valuable resource to Earthwatch’s conservation agenda, employing the skills and time of Shell employees on important environmental research initiatives worldwide. Shell is a major long-term supporter of Earthwatch research, both directly and through the contribution that Shell employees make each year as volunteers on Earthwatch projects. 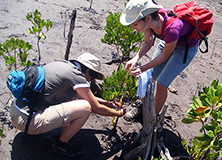 The core funding employs a number of research and support staff and is used to engage Earthwatch teams on the project each year. The relationship also supports three local Ph.D. candidates who work alongside Earthwatch scientists on their own independent projects. The program engages local stakeholders and emerging scientists from the region in the research, enabling them to build their field research skills and regional networks through participation in the program. The Business Skills for World Heritage program was developed by Shell and the Shell Foundation with funding from Shell and is implemented by Earthwatch and run in collaboration with the UNESCO World Heritage Centre. This capacity-development program trains staff of agencies responsible for managing the natural World Heritage Sites, to date in Southeast Asia and Africa. Experts from Shell visit the project sites, where they share their experience and provide hands-on mentoring, sharing their knowledge and instilling preferred practice. In 2012, with support from the Shell Foundation, Earthwatch began to expand this program and reach out to a wider range of corporate organizations and other natural protected areas through the establishment of the Earth Skills Network to continue to provide invaluable business planning skills training. Since 2012, Earthwatch has been working with Shell’s Social Investment team and the International Union for Conservation of Nature (IUCN) to develop and pilot guidelines for Shell Social Investment managers on how to appraise, design, and support biodiversity and ecosystem services projects that will deliver lasting benefits for society and the environment, in alignment with Shell priorities. This project aims to build capacity and understanding of conservation within the Shell Social Investment community and improve its ability to monitor and report on conservation projects at the country and group levels. Shell values the continuing dialogue between Earthwatch and the company over their approach to key issues such as climate change, non-conventional oil and gas, and Arctic exploration. Earthwatch provides annual feedback on Shell’s Sustainability Reports, and there are increasing opportunities for dialogue between senior Shell staff and Earthwatch scientists. 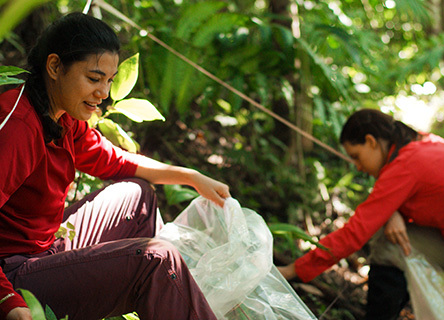 Every year, 49 Shell employees volunteer on Earthwatch projects. To date, more than 500 Shell staff have taken part in the program, they return with a greater awareness and understanding of environmental issues. Shell receive annual feedback from Earthwatch on Shell’s Sustainability Reports.